Yesterday’s breakout above 1.16582 has failed today with the EUR/USD now approaching interesting minor trendline + 1.16196 support. Ideally, this support should contain this pullback for the EUR/USD although not a critical level. 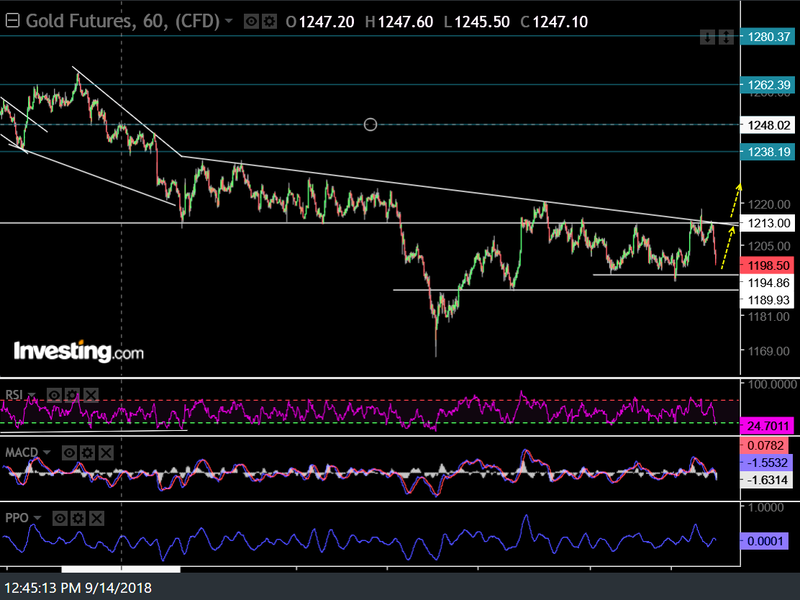 We’re also still awaiting an impulsive break & close above the key 1213 resistance level on /GC (gold futures) to help firm up the case for a likely rally in gold & the mining stocks. Is Gold About To Shine? Hello Randy. 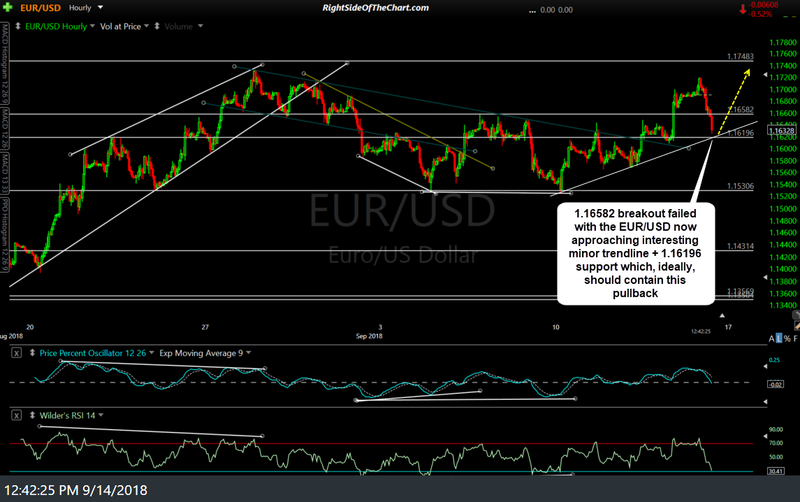 Do you still have a bullish outlook on EUR/USD? I am seeing MACD and RSI negative divergence forming on the 1 hour time frame. Yes, I still have a bullish outlook (intermediate to longer-term) on the EUR/USD. That in no way assures that my analysis is correct but nearly everything that I’ve seen over the past several months has re-affirmed the case that the Euro is in the process of putting in a significant top against the US Dollar. Although much of the analysis the that I’ve posted in recent weeks has largely been focused on this 60-minute time frame, the much, much more significant daily & weekly time frames (as far as the intermediate & longer-term outlook goes, not the near-term outlook of just days or a couple of weeks like the 60-min charts help with) still look bullish. The first chart below is the weekly chart of the EUR/USD that shows the bounce off the bottom of the support zone that defined the top of the 2.5-year basing pattern in the EUR/USD, a successful backtest of that key former resistance, now support level so far. Also, note the recent “clean” bullish crossover on the weekly PPO & compare that to the price action in the EUR/USD following the previous “clean” bullish crossovers. Finally, also note the weekly RSI coming off the high-end of oversold readings (70-level) on this most recent pullback. Even in a bear market, initial tags of the 70 level on the RSI often, but not always, produce near-immediate rallies. In a bull market, including early stage bull markets (if this is one) are outright gifts, with prices usually mounting a substantial & lasting rally from there. Only time will tell if this is the latter but so far, it seems that is the most likely scenario by a fair margin to me. The indicators are pointing down. Thank you Randy. Very informative.